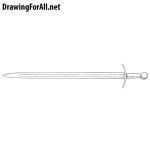 Hello dear readers and artists and welcome to drawing tutorial on how to draw a gladius! 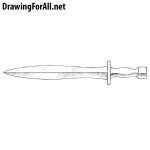 Gladius is a Roman short sword (up to 60 centimeters). Presumably, it was borrowed (and perfected) by the Romans from the ancient inhabitants of the Iberian Peninsula. Gladius is an absolutely straight sword. In order to make it straight draw a straight line that will pass through the center of the sword. At the end of the line we draw a pommel in circle shape. Gladius has a very unusual figured grip that allows to hold the sword better. 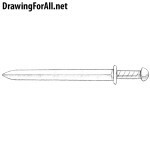 Continue drawing the gladius. 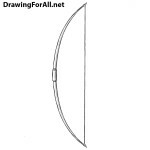 Draw the guard in the form of a semicircle as in our example. Draw the not very long (because the gladius is a short sword), wide and slowly narrowing blade. Erase the line from the first step, leaving the part of the line only on the blade of our gladius. Add shadows with slightly inclined hatching and glare using inclined short strokes on the blade. 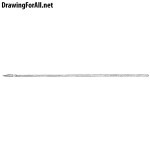 Drawing lesson in which we talked about how to draw a gladius finished. In one of the previous lessons, we told how to draw a xyphos – an ancient Greek sword. 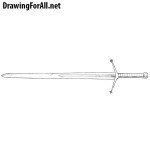 In addition, on the pages of our site there is a huge amount of lessons about weapons, for example, how to draw a spear or claymore.